All smiles, originally uploaded by Aubs. 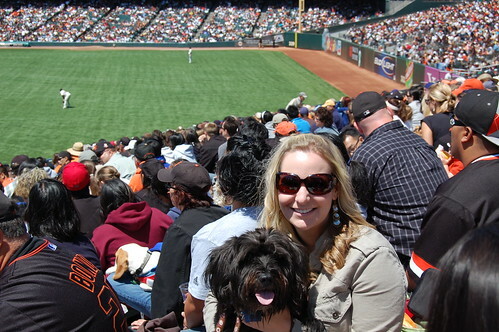 Daisy and I took Lila Belle to the Giants game on Saturday – was the first in what ended up being a LONNNGGGG fun day. Gotta love a city that is so pet-friendly that even our four-legged friends get to enjoy a tasty chilled beverage** at a Baseball game! ** And by “chilled beverage”, I was referring to the SPCA volunteers that made sure the dogs had enough water, not the spilled beer that Lila actually preferred as her beverage of choice.